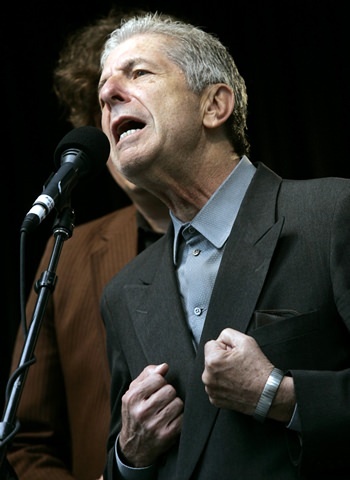 Los Angeles (AP) — Leonard Cohen, the baritone-voiced Canadian singer-songwriter who seamlessly blended spirituality and sexuality in songs like “Hallelujah,” ‘’Suzanne” and “Bird on a Wire,” died last week at age 82. He remained wildly popular into his 80s, when his deep voice plunged to seriously gravelly depths. He toured as recently as earlier this year and released a new album, “You Want it Darker,” just last month. Adam Cohen said his father died with the knowledge that he’d made one of his greatest records. Cohen’s “Hallelujah” went from cult hit to modern standard, now an unending staple on movies, TV shows, YouTube videos, reality shows and high school choir concerts. Cohen, who once said he got into music because he couldn’t make a living as a poet, rose to prominence during the folk music revival of the 1960s. During those years, he traveled the folk circuit with younger artists like Dylan, Joni Mitchell, Joan Baez and others. It was Dylan who first recognized the potential of 1984’s “Hallelujah, performing it twice in concert during the mid-1980s, once in Cohen’s native Canada. It had gone unnoticed when it came out on an independent-label album that had been rejected by Cohen’s label. He had filled a notebook with some 80 verses before recording the song, which he said despite its religious references to David, Bathseba and Samson was an attempt to give a nonreligious context to hallelujah, an expression of praise.